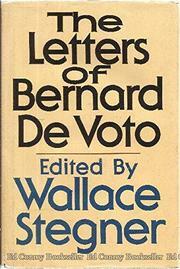 Novelist Stegner, who wrote his friend Benny DeVoto's life in The Uneasy Chair, follows up with 148 letters chosen from the many thousands DeVoto dispatched to private people and public figures. Aside from the opening section, called "Self-Scrutiny" by Stegner, the letters generally grapple with ideas (and with not a few idiot correspondents) and are not chosen to expand on the inner life revealed in the biography. They cover Benny's studies of Mark Twain and his dealings with the hopelessly tangled Twain estate, his life as a teacher at Northwestern, Harvard, and Bread Loaf Mountain Writers Conference, his argumentative volleys for over 20 years from "The Easy Chair" column in Harper's, his spats with Sinclair Lewis and Norman Cousins, Van Wyck Brooks, Malcolm Cowley. Also covered are his involvement in the literary life, his work as a historian, his unflagging devotion to conservation of the West and his dedicated support of Adlai Stevenson for President. Stegner tells us DeVoto suffered most of his life from "nervous depressions, migraines, and blind panics" but that whenever he noted these horrors in others he was the first to help. The letters overflow with vitality and reveal him as less of an intemperate jawbeater than a man with a passionate grip on hard facts, capable of change in the face of superior argument. Vehement and lively -- for those with some memory of his rambunctious column.